My grandmother, Clare Ransom Davis, was born on the Davis family farm about six miles from Moscow, Idaho, in 1914. She was the second (and last) child of Clara Pearl Ransom and Sterling Price Davis. Grandma wrote a story about her father that I will share in a later piece. In 2000, my aunt did an oral history interview with Grandma. The cassette tape copy she gave me degraded badly over the years, so I was unable to do a verbatim transcript. But I was able to take detailed notes about each story she told. Not long after Clare was born, her mother moved with the two girls into town during the school year. Grandma loved the farm, but she only spent summers and some weekends with her father until she was 14 years old. These are a few of her recollections. My father had to stay by himself in the winter time to take care of the animals, while mother lived in a house in town where she had four college students boarding (freshman boys). In spring, after grade school on Friday nights, I would walk part way toward the farm and father would meet me on his saddle horse or come into town with a buggy to pick me up. I would ride behind him on the saddle horse. I would spend the weekend with him to keep him company and I loved it on the farm. We had a two-story house with only one room upstairs. In the summertime, it was too hot to sleep inside, so father set up two tents, one for men, one for women. The farm’s income came mainly from alfalfa. The University of Idaho had to buy bales of hay for their stock and they were quite particular, but they usually bought ours. When the alfalfa was ready to cut, they put it in shocks out in the fields. When it was time to bale, they moved it to the baler on slips made of boards hauled behind the horses. They were no more than 12 inches off the ground. When the slip was ready to be hauled, it was loaded until it was like a regular haystack. When full, it was pulled into a baling site and a pole was put across the front, supported by other side poles and the slip was pulled through to unload so it wouldn’t have to be done by hand. That was a busy time. They would come in at noon to rest and would be very tired. Father would lie on his side. I was very young, probably not more than two, and thought if Dad was lying on his side that his hip looked like a dandy place to sit and so I sat there and listened to the conversations. I didn’t understand them all, of course, but I was part of the picture. I enjoyed those lunch times. When I was older, one of my jobs on the farm in the summer was to take lunch to the workers in the field, so they wouldn’t have to quit so long to go to the house. I would also take a jug of water tied to the saddle horn. I was riding off to the field with my load and came to a country gate. I had to get down off the horse and open the barbed-wire gate to get the horse through. As I was closing the gate, the horse decided not to wait and ran off down to the field with the sandwiches and water. I was disgusted, but not crying. When Dad saw the horse, he thought I was being dragged by it. He grabbed it and turned it around so fast, thinking I was hurt. It didn’t even break the jug. We had a good many pets on the farm. All the pets lived outside or in the barn. We had a nice collie dog and a family of cats, all black. A little black cat found out my father went to the barn twice a day to milk the cows. Dad had been known to squirt some milk in their faces so they could lick it off and they thought that was a fine idea. So, when it was milking time, my father got his clean bucket and headed off toward the barn where the cows were and those black cats lined up in a row behind him and they all trooped off to milk the cows. The cats walked with their tails upright and a little kink in the end, so they were a sprightly little troupe. Sterling Price Davis died on January 1, 1933. His older daughter, June, and son-in-law, Paul Wickward, bought the property and ran it as a dairy operation. They reared their four children on the farm. It was sold in the 1960s, but the new owners took an interest in the history of the family. Many Wickward family reunions have been held there. I visited Moscow for the first time in 2013 and enjoyed touring the farm (much of the land has been sold off) along with one of the Wickward’s adopted grandsons, who lives in Moscow. The owner gave me a souvenir milk can to bring home. I plan on visiting the farm again next year, when the Wickwards will have another reunion. It will be the first time I will meet many of these cousins. Some I have communicated with by email or phone, but not met face-to-face. I look forward to making my own memories about the Moscow farm. Love the pictures. The house is remarkably attractive, isn’t it, and the old cars have become pieces of art. Love Idaho, although we never got as far north as Moscow. We did get to drive through the Sawtooth Mountains when my husband was based at Mountain Home, and enjoyed a monthly drive into Boise. 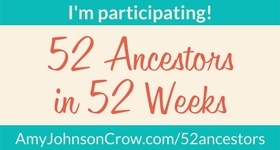 I got interested in genealogy there when a woman talked about finding a Civil War ancestor! What’s funny is that in my mind I never pictured the farm being on this hill covered with evergreens and all the rolling land around it. I imagined all farms being flat like in the midwest! Idaho is a beautiful state. I was so glad to visit Moscow, given all the family history there, but I really had never been before 2013. Thanks for reading! Enjoyable and interesting. Every time I hear Sterling Price I think of the drunk cat on Rooster Cognurn. The cat in the john Wayne movie Rooster Cogburn is named after your grandpa. The cats full name was general sterling price. I probably shouldn’t introduce the General to my dog! I’m really grateful my aunt had the idea of interviewing her mother. She was getting Alzheimer’s by then. Loved reading your Grandmother’s story. The farm is beautiful, not what I was imagining while I was reading! It wasn’t anything like I imagined it would be, either, having never been to that part of Idaho before then. The story and the photos are all wonderful. Being a cat lover, I of course love the cat stories. And the photo of the shoes!!!!!!!!!!!!!!! Wow! The shoes are a hoot. That’s not all they’ve found, but that’s another story. Should I stay tuned for that revelation?! My, you have an interesting family. I love old family photos, especially the many that I used in my book: https://www.amazon.com/gp/product/B00K1L3XMK/ It is a genealogy novella that celebrates hard work in building the American West. I didn’t buy a copy, but haven’t read it yet, just the excerpt. I am fortunate to have stories like these. But I always wish I had more!